I'm risking posting five photos tonight as there's no dominant theme today – but rather, sitting in a Swiss (I think, see below) – Italian restaurant full of spaghetti and rejuvenating beer, and regular guests aruond me talking of Berlusconi's absurd victory in the Italian elections, a glow of accomplishment having at last cycled more than 80 miles in a day (81.27 to be precise), and gone over 1000 miles since leaving Cirencester (1020, to continue precise.). That was a long lead para, which Bob at Reuters in Moscow anno 1974 would have had me rewrite. But full day = lots of words and images. Such as, the Rhine in its upper reaches along the Swiss-German border along which I've been riding since leaving Rolf and Karen reasonably early, after a late evening helping Karen's brother Fred recast a letter of acceptance in English for a job as food and beverage manager at a new mega-hotel, five stars, on the Bulgarian Black Sea coast at Varna. Not everyone's cup of tea, but Fred is an old hand at this stuff. Another long para. Sorry Bob. 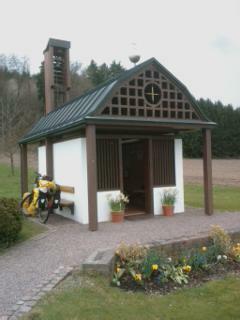 Or, a delightful little newly-built roadside chapel I chanced upon along the bike path, in what I think was Germany as the road dips in and out of German and Swiss territory every couple of miles as it follows the Rhine eastward. Very confusing. People everywhere hurt, and are moved to share their experience of meaning, and sometimes healing, with others. The metaphors of Christianity give very accessible expression to that, and it was a briefly moving place to rest for a moment, and light a candle. 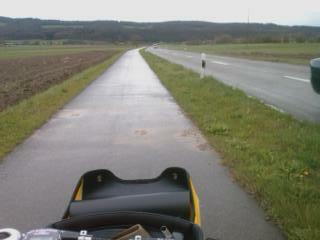 Or, in the rain (yes, it poured today, but only for an hour or so, and with fabulous new waterproof gloves and top, I was dry by the time I put my tent up tonight alongside the river), a view of the splendid cycle paths the Germans routinely install alongside most of their larger roads. 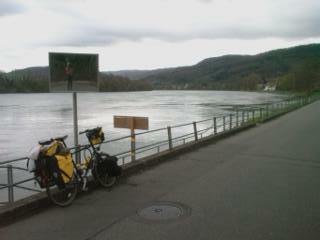 The Germans have seriously Got The Plot when it comes to cycling. And with much else. I will post, in due course, pictures of German photovoltaic solar energy generators.Virtually every roof in Bavaria has one – putting Germany light years ahead of the rest of Europe. After the charming but often annoying flakiness and self-centredness of France, it's VERY good to be in the very familiar territory of German-speaking Central Europe. 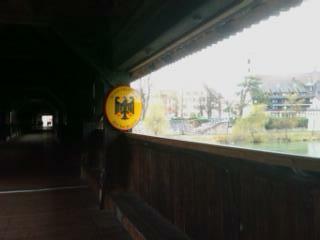 Or, back to the pictures, two views of one of the magnificent covered wooden bridges which punctuate the Rhine's still adolescent progress in these parts – in Stein am Rhein with the border, marked by an efficiently large German sign, half way along. 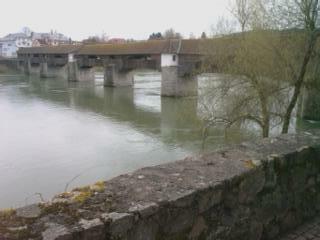 Echoes of Merryl Streep and Clint Eastwood in the Bridges of Madison County. Das waers fuer heute. Mit dem herzlichsten Dank an Rolf und Karen und Fred fuer gestern.